The Nottinghamshire village of Askham  lies as the crow flies some 12 miles to the north of Upton Hall, it is just off the A1 and is a small peaceful place. 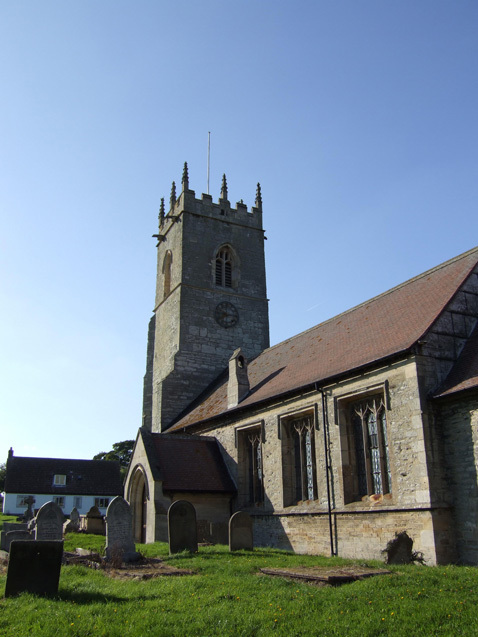 Early in 2008 comprehensive restoration work was carried out on the church clock, funding was through a substantial grant from the Heritage Lottery Fund. Ashkam church clock is a two-train plate and spacer movement that has a pin-wheel escapement, a pendulum of about 1½ seconds, has a count wheel for striking control and bears a nameplate of Potts of Leeds with the date 1912 . There is single five feet diameter cast iron skeleton dial on the east face of the tower with typical Potts hands. The clock strikes on the largest of the three bells in the tower. Motive force comes from two weights; a triple line system is used on the pulleys to get seven-day running period with the limited available drop. The church clock was giving problems, being unreliable and performing in an erratic manner. The churchwardens chose the Cumbria Clock Company to do the restoration work and required that the job be carried out in a sympathetic manner to carefully conserve the clock. An inspection revealed that several things were amiss; the clock was in need of a good clean being covered in oil and dust [2,3]. Next the escapement was badly worn , and the motionworks and leaning off work were in poor shape. Finally the bell hammer was very rusty and out of order and the external cast-iron dial was seen to be cracked in several places . The plan was to take everything back to the workshop for renovation. It is always best to do work in a controlled environment rather than working on site, though sometimes site work is impossible to avoid. Using rope access, the hands were removed, the dial then carefully taken off the tower wall and lowered to the ground . Since the dial was on the east face of the tower above the church roof, considerable care had to be taken on this task. The complete movement was removed from the tower along with bell hammer, leading off work and motionworks . Once in the workshop the years of accumulated oil and dust were removed from the all parts using a water-based cleaner that did not use ammonia or acid-based brighteners. Since sufficient paintwork was left and the tower environment was dry and ventilated; it was decided to leave the frame just exactly as it was without being repainted. New paintwork should only be used where there is a severe loss of the original paint. The whole frame and wheelwork was treated with microcrystalline wax; this is a synthetic wax that museums use to protect metalwork. It has the advantage of protecting the surface whilst not attracting dust and can be easily washed off with white spirit. On the frame some new bushes were needed. In the turret clock world a thin-walled bush is used and bored out in-line. In this way most of the original bush is retained. The bell hammer was in bad way and terribly rusty. With the surface rust removed the hammer was treated with a neutraliser and then painted with several coats of rust resistant paint. When there is no surface finish on such a part, preservation by rigorous cleaning and painting is the only practical solution  . Cast iron dials are becoming a problem with fixings often being found in bad way and cracks showing up. Some dial were deliberately made with joints to relieve stresses when the casting cools. Askham dial was observed through binoculars and seen to have at least 10 cracks. The only safe option was to remove the dial; the breaks were welded by a specialist and the whole dial, cleaned, painted and the hands and chapters gilded with 24 carat gold leaf [8.9]. New weight lines were fitted and the pulleys refurbished and bushed. Worn pulley arbors often account for a significant loss of power . Now the style of the clock movement is certainly not of the sort that Potts were producing just before World War 1. We know that in 1912 the church was looking for a clock and quotes were received from Potts of Leeds for two offerings; a first rate clock with two dials for £65, or the same clock with one dial at £45. The churchwardens chose the second option and the clock was duly installed and set going. The clock is on the first floor of the tower and mounted high up on the wall, supported by cast-iron brackets. It is easy to see the reason for this less than satisfactory arrangement, the pendulum beats approximately 1.5 seconds and is about seven feet long. Often clocks like these were provided with a platform for the clockwinder to stand on, but Askham must have been an economy job since it needs a step ladder to do the winding. William Potts made the church clock for Ilkley in 1848 ; Edmund Beckett Denison was the designer. Comparing the two movements the similarity is very close and leads to the conclusion that the Askham clock was originally one made by William Potts, probably when he was in Pudsey. Michael Potts, author of the book ‘Potts of Leeds’ believes the Askham clock was originally supplied to Guiseley church in 1855 and taken out in 1911 when Potts installed a three-train movement. Askham clock movement is almost identical to the clock in Ilkley parish church; on the front of the Ilkley frame is cast in raised letters ‘William Potts Pudsey 1848’. Inspection of the same area of the clock fame on the Askham clock shows some work has been carried out and the frame overpainted . There is little doubt that originally Askham clock was an early example of Potts work, was signed Potts and dated, but this was subsequently removed. Recycling of clock movements was common; no doubt Potts refurbished the clock to ‘as new’ condition and used it to secure a sale for a church were the price was of key importance. They did not reveal that the clock was secondhand. Clockmakers have for centuries been reusing clock movement, cases or clock parts. In the Society of Antiquaries is a lantern clock which has been made from a church memorial brass. It was quite common for a turret clockmaker to take an old clock in part-exchange for a new one. The old clock would be either used for the scrap iron and brass, or refurbished and sold to another customer. In the 20th centuries this practice was alive and well. With the introduction of electric clocks from 1930 a large number of mechanical clock movements were taken out. Many were scrapped, but some have found their way back into service. Potts of Leeds were a major manufacture of turret clocks in the 19th century. The company evolved from the early individual clocks made by William Potts who started in Pudsey and produced his first turret clock in 1848. By 1900 Potts had installed hundreds of turret clocks, most of them being a standard design they had developed. Potts’ clocks had interchangeable parts, this meant that savings could be made in manufacture and assembly. Although other turret clock companies like Smith of Derby and Joyce of Whitchurch employed a standard design, they did not reach the level of interchangeability that Potts achieved. Despite being recycled, the clock did good service, and will continue to do so following its overhaul. The clock was re-installed early in 2008 along with celebrations in the village. Funding for the project came from local sources in the valuable form of voluntary labour. The Heritage Lottery Fund contributed 90% and the Manifold Trust the remaining 10% of the money. A good spin-off from the Heritage funding is the requirement for the church to provide an explanation of the clock for the public at large. The church met this challenge by signage, an information board, a video camera in the tower since access is not convenient for public use, and a set of PowerPoint presentations prepared by the turret clock historian Chris McKay. Overall the project was a good example of Heritage work involving a range of the community, local people, and historical research. A good conservation philosophy was adopted that will preserve the clock in a going condition and serve the local community for another generation or so.